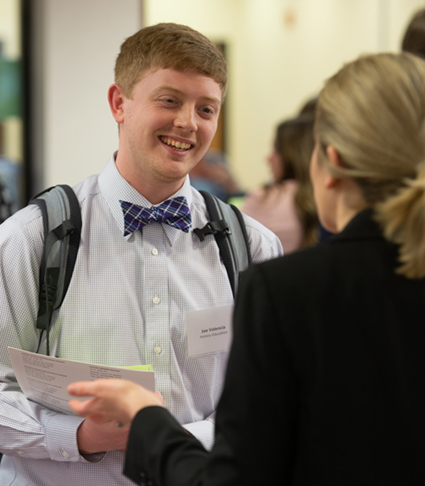 Job-seeking students expressed their nervousness, but excitement about the opportunity to meet with an array of prospective employers. 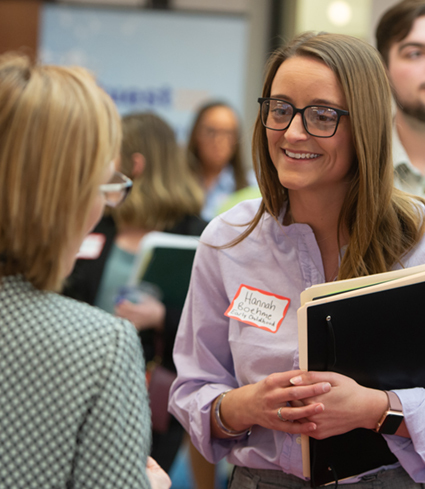 SIUE students have proven to be valuable additions to the work environment of many of the employers who return annually to recruit the latest group of high-quality educators. Timadj Wellmaker earned a bachelor’s in special education from the SIUE School of Education, Health and Human Behavior in 2018. 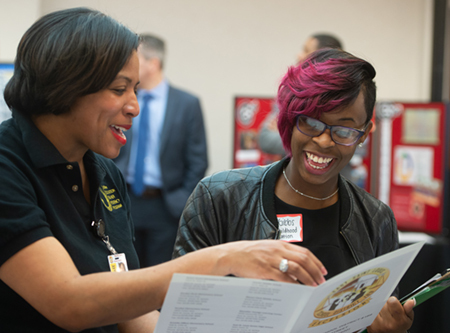 After completing her job search last year, she attended the career fair to tell others about the Urban Education Residency Program. With graduation nearing, SIUE students were grateful for the chance to make significant progress on their application process. Photos: SIUE early childhood education major Jami Gibbs (R) smiles alongside Tracee Wells (L) while learning about the East St. Louis District 189 Urban Education Teacher Residence Program. SIUE early childhood education major Hannah Boehme engages with a prospective employer during the Education Career Fair. SIUE history education major Joseph Valencia attended the Education Career Fair to network with prospective employers.